In the oral cavity Prevotella spp., Porphyromonas spp., Peptostreptococcus spp., microaerophillic streptococci, and Fusobacterium spp. 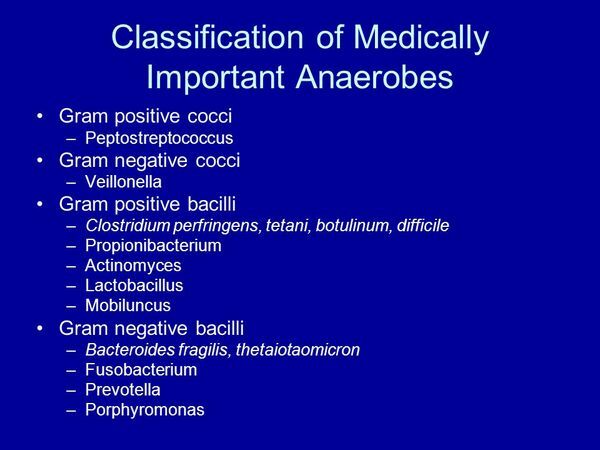 are the most important anaerobes found; they significantly outnumber aerobic bacteria (1000:1 ratio). On the colonic lumen, Bacteroides fragilis, other Bacteroides spp., clostridia, and the previously mentioned oral flora are by far the predominant colonizing organisms (1000:1 ratio to aerobes) and play a crucial role in maintaining the delicate balance of local microflora as well as in metabolizing bile acids and cholesterol and absorbing vitamin K.
Fusobacterium nucleatum, B fragilis, Prevotella melaninogenica, and Peptostreptococcus spp. are the most common anaerobic organisms in this site. Lactobacillus spp., the predominant species in this location, protect against bacterial vaginosis. In nature, species of the Clostridium genus are found in decaying vegetation, soil, ocean sediment, and in human and animal gastrointestinal tracts. Tetanus and botulism (caused by the toxins of C tetani and C botulinum) are examples of exogenously acquired anaerobic infections. The facultative gram-negative anaerobic bacillus Capnocytophaga canimorsus is part of the normal oral flora of canine species, but in susceptible hosts such as immunocompromised individuals, it may cause septic shock and disseminated intravascular coagulation, an example of an animal-to-human transmission of infection. Anaerobes are defined as bacteria that cannot grow on the surface of solid media in an atmosphere containing = 18%-20% of oxygen even when this atmosphere is enriched with = 10% of CO2. The degree of oxygen tolerance differs among these microorganisms; a facultative anaerobe is a bacterium that can grow in either the presence or absence of oxygen, and a strict anaerobe is one that requires < 0.5% oxygen to grow on an agar surface. Microaerophilic is a term used for bacteria that grow poorly aerobically but distinctly better under 10% CO2. Anaerobic bacterial species are numerous; taxonomic data are sometimes confusing and have undergone recent changes. For the purpose of this chapter, we have focused on the most representative pathogens (Table 1). The pathogenic role of anaerobic bacteria was well established at the beginning of the 1900s. 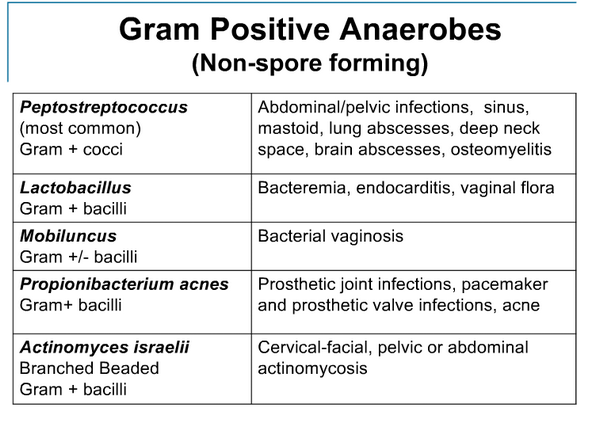 Most infections that involve anaerobes arise from the host’s normal indigenous flora, as these bacteria are widely distributed among humans and other animal species. Organisms that are most important are those present in significant numbers at the sites of infection as well as those with high virulence or greater antimicrobial resistance. Anaerobic environment causes defective neutrophil killing and microbial growth is slower; therefore antibiotic susceptibility decreases. Bacterial enzymes such as collagenase and hyaluronidase promote tissue destruction. Organisms such as B fragilis have a polysaccharide capsule that impairs phagocytosis. Toxin-mediated effects are important in the pathogenicity of most of the genus Clostridium. This occurs in the form of absorption of preformed toxin such as in cases of botulism or as a result of bacterial overgrowth and toxin production, which is the mechanism of antibiotic-associated C difficile colitis. Synergism plays a crucial role in anaerobic pathogenesis, especially in the context of mixed infections because the presence of other aerobic bacteria helps create the optimal environmental conditions for the proliferation and virulence of anaerobes. Normal anaerobic flora become pathogenic under circumstances in which natural barriers that prevent it from gaining access to sterile sites are disrupted. This might happen by a variety of different mechanisms and depends on the site in which the florae occur. In pleuropulmonary infections, the usual precipitating factor is an alteration of the level of alertness that may impair the gag and cough reflexes. General anesthesia, cerebrovascular accidents, a variety of drug overdoses, and alcohol intoxication are examples of situations in which normal oropharyngeal flora gains access to the “sterile” lower respiratory tract; dysphagia, and esophageal or gastric outlet obstruction may also lead to aspiration of large amounts of anaerobes. Trauma and tissue ischemia are two important mechanisms that predispose to anaerobic infection: seriously contaminated wounds are an example in which poor blood flow and tissue necrosis provide an ideal environment for C perfringens to grow and produce significant amounts of toxin eventually leading to gas gangrene. Systemic diseases, such as diabetes mellitus in which the immune response is impaired and vascular compromise might be present, predispose to soft tissue infections of the lower extremities in which anaerobic organisms are commonly found. The presence of foreign devices in different sites may be associated with certain anaerobic infections. Classically, women with intrauterine devices may develop actinomycosis. Central nervous system shunts can become infected with skin colonizing Propionibacterium spp. 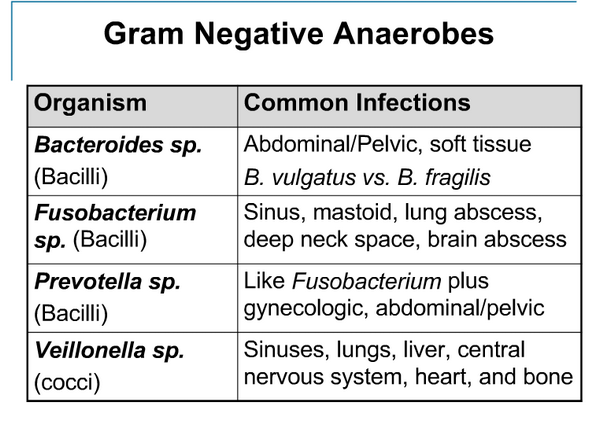 In postsurgical abdominal infections, manipulation of bowel causes translocation of bacteria into the peritoneal cavity: anaerobes are universally present as copathogens in a polymicrobial flora. Administration of broad-spectrum antimicrobial agents alters the normal colonic flora and allows C difficile to proliferate uninhibited; toxin production by this organism leads to the development of antibiotic-associated pseudomembranous colitis. Table 1. Important anaerobic bacteria. DTP (diphtheria, pertussis, tetanus): Recommended doses (IM) should be given at 2, 4, 6, and 15-18 mo, and at 4-6 years of age. 1) Combination therapy directed against concomitant aerobic pathogens is of paramount importance in successful treatment of anaerobic infections; other agents used will depend on specific infection sites and resistance patterns of other organisms. All dosing information is for adult patients with normal renal and hepatic functions. Pediatric dosing: penicillin G, 25,000 U/kg/d; metronidazole, 30 mg/kg/d; clindamycin, 25 mg/kg/d (in patients with normal renal and hepatic functions). 2) Imipenem, 500 mg IV every 6 h, or meropenem, 1 g IV every 8 h if resistance to other first-line agents is encountered. 3) Ticarcillin-clavulanic acid, 3.1 g IV every 6 h; piperacillin-tazobactam, 3.375 g IV every 6 h; ampicillin-sulbactam, 1.5-3.0 g IV every 6 h; amoxicillin-clavulanic acid, 500 mg orally every 8 h.